Political news in the opening weeks of 2014’s midterm year has been dominated not by the upcoming national election, but instead by the one coming after it, in 2016. The year’s biggest political story is Gov. Chris Christie’s (R-NJ) bridge controversy, which is a story about the next presidential campaign and how much damage it does to Christie’s presidential hopes. The full 2016 story remains to be told, but the only connection Ft. Lee has with 2014 is Christie’s chairmanship of the Republican Governors Association, which supports GOP statehouse candidates. Perhaps the second-biggest political story of the year so far is the tremendous fall from grace of former Gov. Bob McDonnell (R-VA), whose months-long ethical struggles culminated in his indictment Tuesday for alleged influence-peddling. The indictment itself is worth a read — not just for political junkies, but also for movie goers who couldn’t get enough of two of this year’s award darlings: American Hustle and The Wolf of Wall Street. The films’ respective directors — David O. Russell and Martin Scorsese — could do plenty with the material. Needless to say, Tuesday was a dark day for our home state of Virginia, but McDonnell’s governorship is over with, and his future national hopes died months ago. His is not a 2014 midterm story either. Democrats are surely enjoying the misfortunes of the two governors whose 2009 victories provided a prelude to the big 2010 Republican midterm sweep, but their futures matter little in the political here and now. Because in the upcoming election — the one that will be contested before the next presidential contest begins — Republicans seem to be on track for a good year, and we’re adjusting some of our ratings to reflect that. As we noted last week, the battle for the U.S. House isn’t much of one. Although individual skirmishes will provide plenty of drama, the end result — a Republican hold in the House — is almost a certainty. More interesting is the Senate, where the GOP has roughly a 50-50 shot to gain the six seats they need to consolidate Congress’ upper and lower chambers under Republican control. Just look at Map 1. We now favor Republicans in four Democratic-held seats: Montana, South Dakota and West Virginia, as well as — in a ratings change — Arkansas, where Sen. Mark Pryor (D) appears to be at least a slight underdog to Rep. Tom Cotton (R) in a reddening state. Assuming Republicans can win those, they have roughly even odds to win in three other states where there are Democratic incumbents: Alaska, which we’ve long classified as a Toss-up, and Louisiana and North Carolina, which we’re switching back to Toss-ups after having them in that category for much of last year. It’s possible that the race for the Senate will come down to these three Toss-ups, with the party that wins at least two of the three controlling the Senate. And that doesn’t even mention the lower-tier races in lighter shades of Red and Blue that adorn the map below, most of which are currently held by Democrats. There are all kinds of circumstances that will impact these races. As we’ve mentioned before, candidate selection — particularly for the Republicans — could make the difference in several places, like Alaska, Georgia, Iowa, Louisiana and North Carolina. But it may also just be that midterm 2014 will simply produce a leveling effect, where overextended Democrats — they hold seats in seven states Mitt Romney won in 2012, while Republicans hold only one President Obama-state seat — simply lose some seats that, in a politically polarized era, they don’t have much business holding, particularly with a potential drag coming from an unpopular Democratic president in the White House. Sean Trende of RealClearPolitics took a detailed look at what Obama’s approval rating will mean for Senate races this fall and the threat it poses to Senate Democrats if it remains closer to 40% than 50%. What follows is not intended to be a full recounting of every single Senate race; rather, we just wanted to address the races where there have been notable developments or where we are making a ratings change. 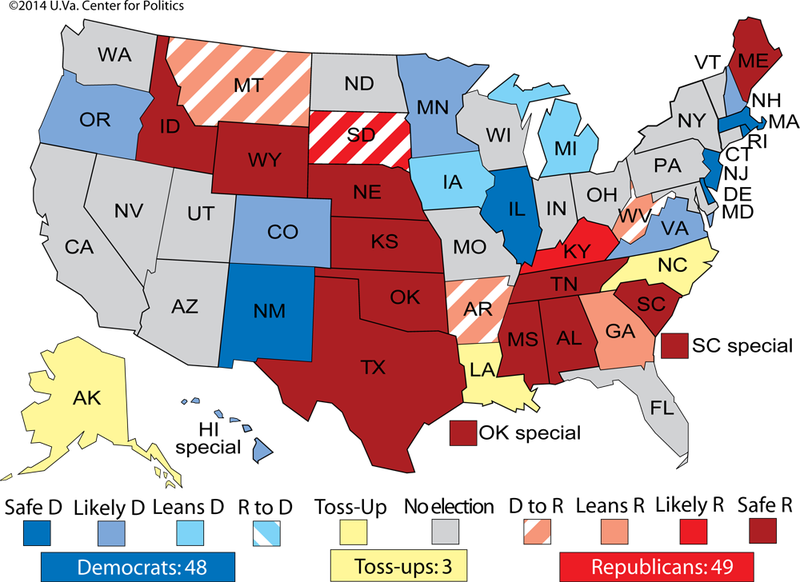 As shown on Map 1, there are 36 Senate races this year. That includes a new race, the special election for the seat of outgoing Sen. Tom Coburn (R-OK). Coming next week, we’ll address and, in some cases rate, interesting Senate primaries coming up over the next several months. ALASKA: There’s no rating change here — this race remains a TOSS-UP. Keep an eye, though, on one of the Republican candidates: former state Natural Resources Commissioner Dan Sullivan (R). In a race where Lt. Gov. Mead Treadwell (R) was seen as the favorite to win the nomination, Sullivan has generated some buzz along with strong fundraising. Meanwhile, Sen. Mark Begich (D) might benefit from a couple emerging local issues. Last year, the city of Anchorage passed restrictions on city public sector unions, somewhat akin to the controversial legislation championed by Gov. Scott Walker (R-WI) that led to a recall election in 2012. Labor fought back, and the restrictions could be decided on Election Day 2014. That could be good for Begich, a friend of labor, in the municipality that could cast about a third of all the state’s votes. Additionally, Begich has come out against a major mining project in southwest Alaska, which a good Alaska source tells us could be a useful wedge issue against the eventual Republican nominee, who is likelier to be closer to the mining industry than Begich. These small-bore developments might matter in a race where the winning candidate might not crack 150,000 votes. Of the seven aforementioned Democratic Senate seats in Romney territory, Begich might be the strongest Democratic candidate running. On the flipside, Alaska is, historically, the least inclined of any of the seven to elect a Democratic senator. Hence Begich’s challenge. LOUISIANA: We’re not going to underestimate Sen. Mary Landrieu (D-LA), who has won three tough races and who benefits from a sterling political name, but TOSS-UP is the more realistic rating here than Leans Democratic. Despite some problems on his right flank, it’d be shocking if Rep. Bill Cassidy (R) didn’t advance to a possible runoff, and such a runoff — which could decide the Senate depending on what happened elsewhere in the country — would be a nationally watched December electoral overtime. Democrats would have reason to worry about turnout problems in a runoff, although it’s worth noting that in Landrieu’s last midterm runoff, in 2002, the total number of votes only fell by about 11,000. The last major post-general election Senate runoff nationally came in Georgia in 2008, where turnout dropped 1.6 million votes (!) from the general, producing a more Republican electorate that powered Sen. Saxby Chambliss (R-GA) to a relatively easy win after Democrat Jim Martin held him under 50% in the regular general election. But, remember, 2008 was a presidential election year, where the general election electorate is a lot bigger. A Louisiana midterm runoff would be different and, admittedly, hard to predict — another reason why we’re changing this race back to the Toss-up category. MONTANA: Retiring Sen. Max Baucus (D-MT) awaits Senate confirmation as the next ambassador to China, a move that will open his seat sooner than expected. Most observers expect Gov. Steve Bullock (D-MT) to fill this vacancy with his right-hand man, Lt. Gov. John Walsh (D), who was already running for Baucus’ seat. This appointment would give Walsh an opportunity to improve his name ID and gravitas in the state as a sitting senator, having only been elected on Bullock’s ticket in 2012. But ethical problems may complicate matters for Walsh: Prior to becoming lieutenant governor, he served as head of the state’s National Guard, and in 2010 a U.S. Army inspector general found that Walsh improperly used his position for personal gain. While this scandal probably won’t deep-six Walsh’s candidacy, it’s another hindrance to his November chances. With Republicans rallying around Rep. Steve Daines (R), their strongest candidate in the general, Walsh naturally has a tough time keeping this seat in Democratic hands during a Republican-leaning midterm year. But it might help Walsh at least a little if his current primary foe, ex-Lt. Gov. John Bohlinger (D), follows through on his recent musings to drop out. Montana is competitive enough so that small things make a difference, and we’ll monitor this contest especially closely. For now, it’s LEANS REPUBLICAN. NEW HAMPSHIRE: Ex-Sen. Scott Brown (R), who lost to now-Sen. Elizabeth Warren (D-MA) in Massachusetts’ closely-watched Senate tilt in 2012, may be about to pull a sort of reverse-Daniel Webster. Webster, one of the most famous American statesmen of the 19th century, represented New Hampshire in the House from 1813 to 1817 before returning to the lower chamber in 1823 as a member from Massachusetts. He later became a senator and one-third of the Senate’s famous “Great Triumvirate,” as well as secretary of state in two different administrations. While Brown may not equal Webster’s historic stature, it increasingly looks like he may challenge incumbent Sen. Jeanne Shaheen (D) in New Hampshire’s 2014 Senate race. The latest signal is his updated website, which now features a slogan “Scott Brown: Giving Power Back to the People.” Although Shaheen would certainly attack Brown as a carpetbagger should he run (though Brown has a home there), the Granite State has been politically jittery in recent years — just take the state’s two House seats, which have been simultaneously flipped by one party or the other in 2006, 2010 and 2012. If the GOP’s 2014 outlook remains positive, Brown may decide this cycle presents his best chance at winning a seat that a moderate Republican could potentially hold on to, unlike his old Massachusetts seat. While we await Brown’s decision, this seat remains LIKELY DEMOCRATIC as Brown may be the only candidate who could give Shaheen serious problems. Should Brown finally declare, we’d probably lower the rating to LEANS DEMOCRATIC. NORTH CAROLINA: Just based on the fundamentals, Sen. Kay Hagan (D-NC) should be in better shape than her fellow Red-state Senate Democrats running for reelection in 2014. Remember, President Obama won North Carolina in 2008 and only lost it by two points in 2012, which makes the Tar Heel State by far the most Democratic of any of the seven Romney states that feature Democratic Senate incumbents this cycle. However, as the national environment has worsened for Democrats since the botched Obamacare roll-out, Hagan’s status as a slight favorite for reelection has ebbed. HuffPost Pollster has her very narrowly trailing state House Speaker Thom Tillis (R) in general election trial heats, even though Tillis only leads GOP primary polling with less than 20% (perhaps an indication of low name ID). Along with an approval rating mired in the low 40s, these are signs that Hagan is vulnerable. Hagan’s weakened position prompts us to move this race from Leans Democratic to TOSS-UP. Republicans should continue to be worried about their potential nominee here, though: Tillis leads the unpopular state legislature, and there are several other lesser-known Republicans in the race who could potentially cause them general election headaches. OKLAHOMA (SPECIAL): Sen. Tom Coburn (R-OK) announced last week that he would resign his Senate seat at the end of the current Congress, in part because of a recurring personal battle with cancer. The seat would normally be up for reelection in 2016, but Coburn timed his resignation so that a special election will be held at the same time as the 2014 general, making Oklahoma the second state this cycle to feature double-barreled Senate elections (along with South Carolina). The twin contests in Oklahoma will be the 50th time since the start of Senate popular elections that a state has held two Senate elections on the same day. In only seven of the 48 previously-held double-barreled contests did voters pick senators of different parties, and we can’t imagine Oklahoma — or South Carolina, for that matter — will become the eighth: This race starts as SAFE REPUBLICAN in our ratings. Rep. James Lankford (R) is the only announced candidate as of this writing, though freshman Rep. Jim Bridenstine (R) and state House Speaker T.W. Shannon (R) may also jump in. Rep. Tom Cole (R) is the most notable potential candidate to take on a pass on the race, probably leaving Lankford as at least a slight favorite on the GOP side, though some well-funded national GOP groups do not believe Lankford is conservative enough for this seat.